While dating Florinda Ho (何超雲), Joel Chan (陳山聰) put his TVB career on hold. Taking numerous long vacations with the wealthy heiress, Joel prioritized love over work. After their relationship ended in May 2013, Joel eventually returned to TVB. Despite his previous record, TVB gave Joel a second chance and cast him in several upcoming dramas. In addition to starring in the currently-airing Noblesse Oblige <宦海奇官>, Joel is also filming dramas Captain Destiny (張保仔), With or Without You (東坡家事), and Vampire <僵>. 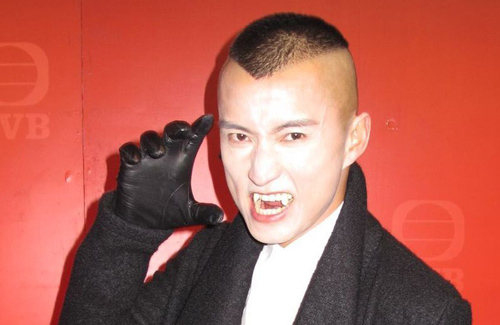 In the vampire-themed TVB series, Joel will portray an evil vampire. Taking cue from ATV’s successful My Date with a Vampire <我和殭屍有個約會>, Joel revealed that the costumes will be modern and stylish. Although Joel has experienced many ups-and-downs in the past decade, including a divorce from fashion designer Pony Yeung in 2011, he has no regrets and believes that the experiences allowed him to grow. While he did not elaborate on the details of his past relationships, Joel hopes to focus on his career and vows to start anew. “Past news is permanently rooted, but I’ve come to terms with that. I’ve learned to live in the moment. There’s a friend that I still miss in my heart. If I see him/her, I will still say sorry. But I will leave it to fate.” Turning 38 years old recently, Joel hopes to find someone special and start a family one day. He comes back a better actor. Enjoying his performance in noblese oblige. not really difficult for him to make a succecful comeback because there is a lack of good actors in tvb. I think he looks good for his age and still has a lot of potential due to his versatile acting skills. I am really getting sick of seeing Him and Oscar all the time. I would welcome Joel’s comeback but I still disagree with his decision to leave his career and friendships for an immature girl. I hope he truly repents and leaves his past behind him. Maybe Christine will eventually forgive him. To be honest, I am soooo glad he came back. He is doing very well in my opinion, he came back as a better actor. Oh well, the past is the past, as long as he’s learnt from all the experience and develop into a better person (which I feel he has). Hope he continues to be better at his performance! i think it’s a shame he left when he did. he was doing quite well as a second lead and i think he may have been promoted ahead of louis cheung. Agree with all your guys. It’s great that Joel is back at TVB. He slotted in effortlessly with his first comeback role in Noblesse Oblige and looks to be more promising as a good actor than before. Always like him as an actor.. waste for him to be a boy toy anyway.. glad he’s back. never doubted his looks and acting skills. would like to see him on tv but my impression of him really changed after the incident which is okay. we just watch him on tv not like dealing w/ him in real life. Failed soft rice king! Didn’t miss him at all when he was away. He must have a strong backer in tvb. I’m glad he returned. I always thought he was a good actor before he left. He certainly would be in more prominent roles if he stayed with TVB. Just have to work your way up again.